Although England had already begun rapid industrialization in the eighteenth century, the United States experienced its Industrial Revolution in the antebellum period. From 1814 to 1865, while population grew by a factor of four; manufacturing output volume grew by a factor of twelve, and the value of manufactured goods grew by a factor of eight. Most of the growth in manufacturing was centered in the New England region, especially in Massachusetts. While agriculture was still the largest sector, manufacturing took hold. The region had inherant advantages in terms of industrial advancement. Local rivers provided power for mills, while coal and iron ore were mined in nearby Pennsylvania. The region's emphasis on education and literacy ensured that there was a literate population for entrepreneurship and industrial labor. Availability of ports and ships facilitated export overseas, and the eventual contruction of railroads and canals such as the Erie Canal helped ease domestic transport of raw materials and finished goods. In the South and Southwest, manufacturing grew much more slowly. The soil and climate were so well-suited to agriculture that it was difficult to establish much of a manufacturing sector. In addition, there was a severe dearth of free laborers, although there were some white and free black people available in the region. Most immigrants arrived in the North, and either remained there or traveled to the West, so the South failed to attract a substitute labor force. In addition, many of financial institutions were located in the Northern states, thus making it relatively difficult for Southern entrepreneurs to obtain capital for investment. One of the major contributing factors to the success of American manufacturing in the North was the use of interchangeable parts to facilitate mass production. New Englander Eli Whitney is credited with introducing the idea of interchangeable parts to the United States in 1800. After inventing the cotton ?gin, he entered the small-arms industry. As a result of a 1798 federal contract to produce muskets, he designed a gun made of precision parts, each of which was mass produced and could be assembled by even unskilled workers. Up to that point, parts for guns (or any other manufactured products) were made individually for each product, and each unit was slightly different from any other. After Whitney's innovation, items could be produced quickly and efficiently in larger quantities than ever before. The use of interchangeable parts was applied to a wide range of products, including Colt revolvers and McCormack reapers. The process was demonstrated in Europe at the Great Exhibition of 1851 in London, and was praised and eventually emulated. European business people and observers called the process the 'American system' of manufacturing. In New England, the pioneering manufacturing successes of Samuel Slater and Francis Cabot Lowell earlier in the century continued after the War of 1812. Lowell's mills, in particular, expanded production in response to increased post-war demand for cotton and other textiles. Mills were established in various locations in Massachusetts, giving birth to mill towns including Waltham (since 1813), Lawrence, Manchester and Nashua. Soon, the American woolen textile industry experienced rapid growth, such that the number of wool factories rose from 100 in 1820 to 2,000 in 1860. 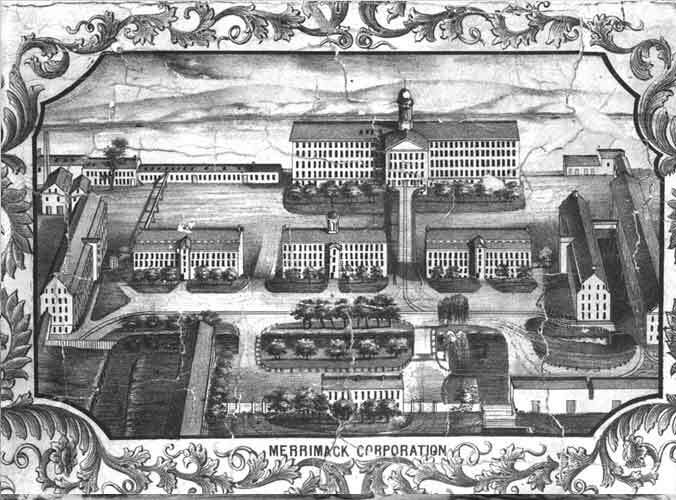 The Lowell factories, which had recruited young ladies to work in the mills, began to experience difficulties accomodating the rapid expansion. In Lowell, Massachusetts, for example, the factory 'village,' in which the young ladies lived, grew from a model town of 2,500 in 1825 to an overcrowded hovel of 21,000 in 1840. The labor pool had swelled to meet the demand for cotton, but without commensurate expansion of living accomodations. Attempts to improve working and living conditions for laborer, who were mostly female, were unsuccessful. When workers organized strikes (called 'lockouts'), such efforts were crushed by the powerful mill owners. Managers turned to immigrant labor, especially Irish immigrants. By 1846, the majority of workers in the Fall River plant, for example, was Irish. In addition to textiles, flour mills and iron factories flourished in the United States in the decades before the Civil War, especially in the New England and Mid-Atlantic states. Infrastructure industries, such as the private companies that built the canals and railroads, were also booming. Many of these industries hired and even recruited immigrants laborers, paying wages that were low by American standards, but higher than what was available in Europe. As factories, railroads and steamboats proliferated, fuel became an important commodity. Timber provided most of the fuel in the West. In the Northeast, however, coal was in high demand. Pennsylvania mines produced coal and iron ore, using immigrant labor. Conditions for miners were atrocious, and workers were cruelly exploited by authoritative management. As in the Lowell mills, the workers had little power to change their situations. Nevertheless, there were more opportunities available in the United States than in Europe, especially in famine-struck Ireland. Thus, immigrants kept streaming into the country, providing much of the labor that ran the antebellum Industrial Revolution.